You guys don’t even know the madness that has been my life recently. Do you ever let things that are not-as-important (like working) get in the way of things that kind of are (like watching Game of Thrones and updating my blog with funny commentators)? I kid, of course, but it has been a ridiculous few weeks. 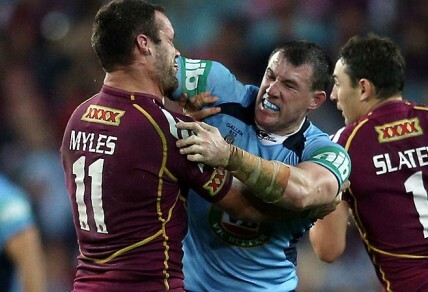 What I’ve been thinking about the past few weeks is State of Origin. But unlike the rest of the country, I don’t care about Paul Gallen’s punch (yes, he probably should have gotten kicked off and yes, it’s hard to explain to your kids that he’s allowed to punch and they aren’t – but aren’t you already having a difficult time explaining to them why heterosexual men love to jump on each other and wriggle around? I miss sport fights – fo’reals). I’m more interested in cash and competition. Let’s think about this for a second here. The cheapest tickets are $56. And that’s obstructed view (DON’T GET ME STARTED ON STADIUMS THAT WERE DESIGNED WITH OBSTRUCTED VIEWS – YOU HAVE NO BUSINESS BEING A STADIUM). The cheapest unobstructed view is $75. That’s pretty pricey. Especially when you consider all the associated costs like parking (or public transport), food and beer, merchandise, and time (some people think that time is free – those people are wrong). Let’s talk about time for a minute (ha ha – time, minute, so funny). When you go to a sporting event, you are, essentially, spending time at the game that you could have spent doing other things like working, playing Tetris, alpabetising your bookshelf… whatever. You don’t get to do those things because you decided to go to the game. This is called opportunity cost: what you theoretically give up – the loss of the potential gain from other alternatives when one alternative is chosen. For instance, if you go to the game instead of alphabetizing your bookshelf (SHOCK HORROR) you are not only losing the time to organise, you are also losing the sanity you get from being able to find books in an orderly fashion. You are losing order and neatness and (probably) cleanliness. That’s what opportunity cost is. The same goes for money. If you spend your money on tickets for you and your partner to go to State of Origin you’re not only giving up $150, you’re also giving up the benefits of the other things you could have purchased. Which means you not only gave up a new pair of shoes… you also gave up the compliments you’ll get on the shoes (assuming you have good taste), the fun of going shopping (assuming you think it is fun), the comfort of wearing shoes that do not give you blisters (assuming your current shoes give you blisters)… and you get the idea. Also remember that it’s not just sports leagues, clubs and fans that have to think about this – EVERYONE has to think about it all the time. It’s enough to drive you mad. Oh, the wonders of being an economist.